Do you have questions? View our Staff Directory or call us at (505) 924-2229. Please note: you must email Tracy to sign up for classes. Please do not call with these requests. Thanks! You can sign up for classes with Tracy by email at tracy@daraluzbirthcenter.org, or at your Intro to Birth Center Birth Class. Most classes are included at no additional charge for birth center parents. Most of our classes are available to the greater community, too, for a fee. Please note, there are some important things for you to know before you come to an orientation! Click below for more info. Sign up for this one after you are a birth center client. Jointly taught by our birth class teachers, this class will answer your most pressing questions and give you essential information about your care at Dar a Luz. You'll also have a chance to learn about and sign up for all your classes. Wondering which birth class to take? After this class, you'll know! Take this class before your 5-week class series, as early in your Dar a Luz care as you can. Email tracy@daraluzbirthcenter.org to register. Monday, February 6, from 6:30 to 9 p.m.
Monday, April 10, from 6:30 to 9 p.m.
Sunday, June 25, from 4:00 to 6:30 p.m.
Sunday, August 27, from 4:00 to 6:30 p.m.
We have a variety of childbirth preparation classes for birth center parents. See the class descriptions for more information on content and cost. All birth center moms must attend one birth class series. Wondering which birth class to take? Sign up for the Intro to Birth Center Birth class and make your decision with confidence. Also, check out our Class Descriptions page for more information on each class. Meets five afternoons, for 2.5 hours each time. Taught by childbirth education expert Amity McElroy. Read about Amity on our staff page, or contact her directly on our contact page. Email tracy@daraluzbirthcenter.org to register. Sundays, February 12 through March 12, 2017, from 4-6:30 p.m.
Saturdays, May 13 through June 10, 2017, from 3-5:30 p.m.
To get on the call-back list for later classes, email Amity from our staff page, or contact her directly on our contact page. Meets five Tuesday evenings, from 6:30 to 9:00 p.m. Extra fee for materials is $75 plus tax, payable to Laura in the first class (for both Dar a Luz clients and non-clients). This class is available to non-birth center clientele as well, for a $300 fee (payable to Dar a Luz), plus the materials fee. Taught by Blissborn founder, hypnotherapist, and childbirth educator Laura Wood. Read about Laura on our staff page, or contact her directly on our contact page. June 6 through July 11* (no class July 4) *Starting in June, Blissborn classes will be three hours each, from 6 to 9 p.m.
To get on the call-back list for later classes, email Laura from our contact page. This class is for women who have given birth before. In certain circumstances, women who have taken a childbirth class from another educator during this pregnancy, or who are late transfers and will not have time to complete a series can join this class too. The Condensed class is not designed for mothers who are not birth center clients, or who are first-time moms. If you are having trouble finding a class to fit your schedule, contact the class teacher to find out about your other options. Taught by Robin Hayter. Read about Robin on our staff page, or contact them directly on our contact page. This class is offered one Saturday each month, from 9:00 a.m. to 2:00 p.m. Bring your lunch! Dinner served from 5:30 to 5:45 (it's usually Dion's pizza and salads, with vegan and gluten-free options always available; please email Laura at least 24 hours in advance if you have other dietary needs). January 22 from 1 to 4 p.m.
February 26, from 1 to 4 p.m.
March 12, from 1 to 4 p.m.
January 29, from 4 to 6 p.m.
June 25, from 11 a.m. to 1 p.m. Attendance in these classes is optional but highly recommended, and included at no additional charge for birth center parents. There is a fee for non-birth center clients, as noted. Take this two-hour class to learn the basics of pumping and storing breast milk and bottle feeding it to your baby. Learn how to clean and care for your pump. Best in your third trimester or after the baby comes. Bring your pump if you can! Led by Amity McElroy or Robin Hayter. Email tracy@daraluzbirthcenter.org to register. Sunday, January 29, from 1 to 3 p.m.
Sunday, March 26, from 1 to 3 p.m.
Sunday, May 28, from 11 a.m. to 1 p.m.
You can come before or after your baby is born, but we recommend doing it before, to ensure that your car is ready to drive your baby home from Dar a Luz. Please register! Email tracy@daraluzbirthcenter.org to register. Please let us know you're coming -- you can RSVP here, or email tracy@daraluzbirthcenter.org (but drop-ins are OK too). Saturday, January 14, from 11:30 a.m. to 1:30 p.m.
Monday, January 23, from 5:30 to 7:30 p.m.
Saturday, February 18, from 11:30 a.m. to 1:30 p.m.
Monday, February 27, from 5:30 to 7:30 p.m.
Saturday, March 18, from 11:30 a.m. to 1:30 p.m.
Monday, March 27, from 5:30 to 7:30 p.m.
Saturday, April 15, from 11:30 a.m. to 1:30 p.m.
Monday, April 24, from 5:30 to 7:30 p.m.
Saturday, May 13, from 11:30 a.m. to 1:30 p.m.
Monday, May 22, from 5:30 to 7:30 p.m.
Saturday, June 17, from 11:30 a.m. to 1:30 p.m.
Monday, June 26, from 5:30 to 7:30 p.m.
Saturday, July 15, from 11:30 a.m. to 1:30 p.m.
Monday, July 31, from 5:30 to 7:30 p.m.
Saturday, August 19, from 11:30 a.m. to 1:30 p.m.
Monday, August 28, from 5:30 to 7:30 p.m.
Saturday, September 16, from 11:30 a.m. to 1:30 p.m.
Monday, September 25, from 5:30 to 7:30 p.m.
Saturday, October 14, from 11:30 a.m. to 1:30 p.m.
Monday, October 23, from 5:30 to 7:30 p.m.
Saturday, November 18, from 11:30 a.m. to 1:30 p.m.
Monday, November 27, from 5:30 to 7:30 p.m.
Saturday, December 16, from 11:30 a.m. to 1:30 p.m.
Email tracy@daraluzbirthcenter.org to register. Please bring a check (payable to Dar a Luz Birth & Health Center) or exact change. Cost is $10 per person or $15 per couple. Sunday, February 26, from 11 a.m. to 12:30 p.m.
Sunday, April 9, from 11 a.m. to 12:30 p.m. Mothers of ALL ages and stages are welcome to join, pregnant mamas included. Babies enjoy this class up until about 18 months. Please bring: yoga gear (we have some to lend, too), diaper bag, water and anything needed to feed your baby. Cost is $12 per drop-in session. Packages available as well: $40 for 4 classes or $75 for 8 classes. Registration is encouraged, but not required. Meets right before Evening Latch & Toddler Group (see below) on the 1st and 3rd Wednesdays of each month for one hour, at 5:30 p.m. Check out the New Life calendar on their website for more yoga with MJ. Join firefighter Kris Romero in a certification course in Infant, Child and Adult Cardiopulmonary Resuscitation (CPR). Learn basic life-saving measures, what to do in an emergency, and how to be prepared. The cost for the class is $35 per person, with cash or check payable to Kris Romero required before class. No refunds. Please contact receptionist Tracy at tracy@daraluzbirthcenter.org to register and arrange payment. Watch for our next one and sign up fast! These usually fill quickly. Monday, January 30, from 6 to 8:30 p.m.
Join Tekla Johnson, Pediatric Sleep Consultant, as she helps parents understand infant sleep and answers basic sleep questions. Learn how infant development affects sleep, routines to start early for healthy lifelong sleep habits, and so much more. The infant class is intended for parents of babies 0-12 months old as well as expecting families. Bring a notebook, because you'll want to take lots of notes! Tekla offers these classes for free but requests a small donation. Saturday, January 21, from 1:30 to 2:30 p.m.
Saturday, March 11, from 1:30 to 2:30 p.m. Please prepay with Tracy: email her at tracy@daraluzbirthcenter.org for instructions. In Danett's Cloth Diaper 101 class you'll learn everything you need to know to successfully start your own cloth diaper journey with your little one. In a fun and comfortable environment, she'll demonstrate how to use a variety of cloth diapers ranging from the "old school" Flat diapers, to the new and more modern diapers. You'll have the opportunity to get a hands on experience to determine which cloth diaper style best suit your needs and lifestyle. You'll also learn about the benefits of cloth diapering, how to properly take care of them, and everything in between. Thursday, January 19, from 5:30 to 7 p.m. In Danett's Babywearing 101 class, you'll learn how to properly and safely wear your baby from newborn through toddlerhood. In a fun and comfortable environment, she'll demonstrate how to use a variety of carriers including slings, wraps, and soft-structure carriers, and you'll have the opportunity to test them to determine which ones best suit your needs and lifestyle. Baby wearing can seem overwhelming at times, especially for first-time parents, but here you'll build the confidence you need to wear your baby calmly and happily. Expectant parents, children, and babies are all welcome to attend. Danett Hernandez is a recent transplant to Albuquerque, having moved here from Denver, Colorado with her husband and four year old son, Sebastian. She just had her second baby. She began wearing her son from the day he was born and was immediately hooked on its amazing benefits, including being able to nurse while keeping her hands free. Danett has been teaching baby wearing for the past four years at hospitals, baby stores, and has even been interviewed for news segments intended to promote the benefits and safety procedures of baby wearing. Discover the benefits of using natural essential oils one drop at a time to safely provide relief for physical and emotional pregnancy symptoms. Learn which oils can help with mood and pain management in labor, and get tips on what to pack in your "go bag." While recovering from the birth find out how to safely use essential oils to heal your body quickly, support mood through the hormonal changes, and support breastfeeding. Learn easy recipes to make all natural care products for your newborn, and gentle ways to support their health and growth. Essential oils can support milk production, address discomfort, and help with weaning in natural ways that are safe for you and your baby. This class will also include conversation about the importance of supplements to ensure proper nutrition for new parents, kids and how to use the top 10 essential oils to support each family member's body's systems for preventive health. When issues arise, having these 10 essential oils on hand will be your tools to handle any situation with confidence. This is an ongoing online and in-person course using positive discipline and the Whole Brain Child method. Facilitated by Antonia Montoya and Jean Zitting, certified Positive Discipline Facilitators, with a focus on gratitude and learning from successes. Let's send a ripple of compassion out into the world! Together we will learn some new skills and strategies thatcan be put to use right away. We will also honor our own strengths, knowledge and intuition; feeling okay to take what works for us and ditch the rest. Expect to feel more connected with your child; learn how to set limits in a way that actually works; facilitate your child becoming a loving, confident, fulfilled, independent, and compassionate adult; understand what the heck your child really needs when they are acting out; improve your relationship with your partner or other adults in your life; and feel calm, confident, energized, and grateful. It's not too late and it's not too early. Whether you have an infant, five kids (like Jean), grand kids, or no kids (like Antonia), you will get a lot out of this program. Because it's not just gratefully parenting -- it is also gratefully "relationshipping." The cost is $35, and you can bring your partner for free! Register HERE. Led by licensed mental health counselors, peer supporters, Dar a Luz moms, midwives and RN birth assistants, our groups grow and thrive organically. Groups meet on a regular schedule so you can plan ahead. People often question whether their experience qualifies them for a "support group," but these groups are for everyone -- all experiences welcome. Telling your story is an important part of moving through it. Come do it in a safe place with caring people. Call us with questions and suggestions! All of our groups are free and open to the community. No registration is required. 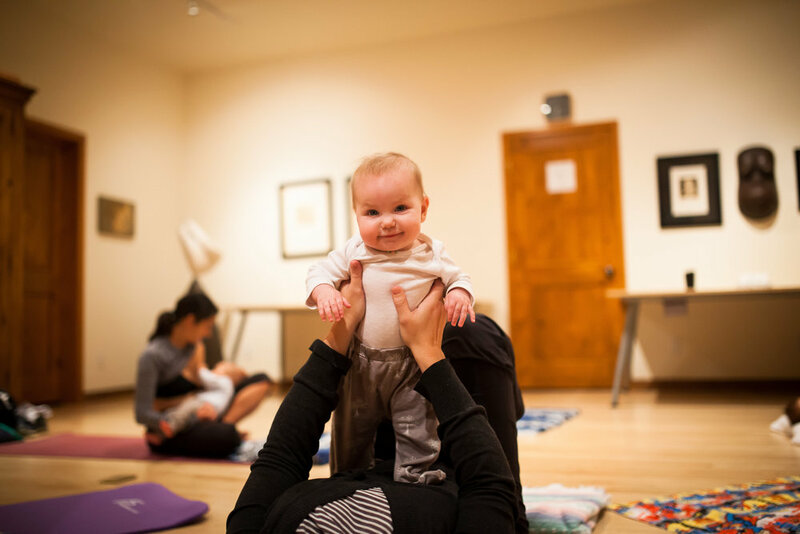 Once a month join us an hour early -- for Mom and Baby Yoga with doula MJ Vargas. See the schedule above. *NOTE: This group will be changing to a monthly Mindful Partnering/Mindful Parenting group starting January 12th (see below). Next meeting: Thursday, January 12, from 6 to 8 p.m.
Thursday, January 26, from 6 to 8 p.m.